Every route can only have a single Caravan on it, but there is no inherent limit to the number of routes that a single City can have beyond that – the limit comes from the number of available Caravans, and the number of other cities available for unique trade routes. The maximum number of Caravans you can have at once is 1 + (1 x Commerce tech level). For nations with no specific Caravan-related bonuses, this means that unlocking the Market with Commerce 1 actually allows for a maximum of two Caravans to be produced, although you would need to have three cities in order to utilise the second Caravan because two cities allow for only one unique trade route to be created. With three cities, each city is able to form a unique route with each of the other two cities, allowing for a maximum of three trade routes. Some people seem to be under the impression that Caravans generate Wealth in large chunks (for example, 30 gold at once). This is.. not entirely incorrect but far from the whole picture. The Wealth from Caravans comes in two stages, kind of like it does with a Farm or Woodcutter’s Camp. You get a bonus chunk of Wealth (twice, see below) for initially setting up a trade route, after which you get constant Wealth production for as long as that Caravan continues to use that trade route. Caravans will automatically use the highest-income route available to them given your directions or lack thereof. For example, if you select a Caravan and right click on a specific city, it will select whichever available route from that city which is most profitable. If you were to leave the Caravan to its own devices, it might select a route that doesn’t involve that city at all. Routes can be manually selected by selecting a Caravan and right-click-dragging between two valid cities. This may be helpful if the most profitable trade routes are actually dangerous to travel along, in which case specifically choosing a safe route may be preferable to having your Caravans killed. In order to create a new trade route, a Caravan must first go to City A, then to City B, and then return once again to City A. 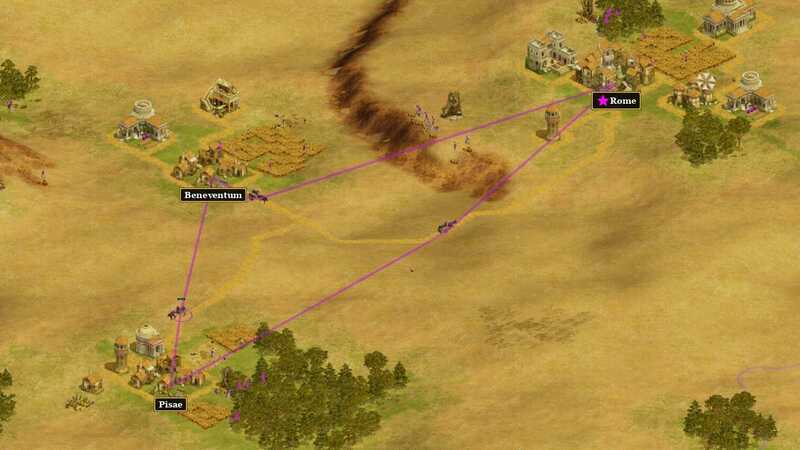 The trade route is formed only after it has finished an entire loop between two cities, and until this process is completed you will not receive a constant income from the Caravan. On the second and third steps of this loop (i.e. 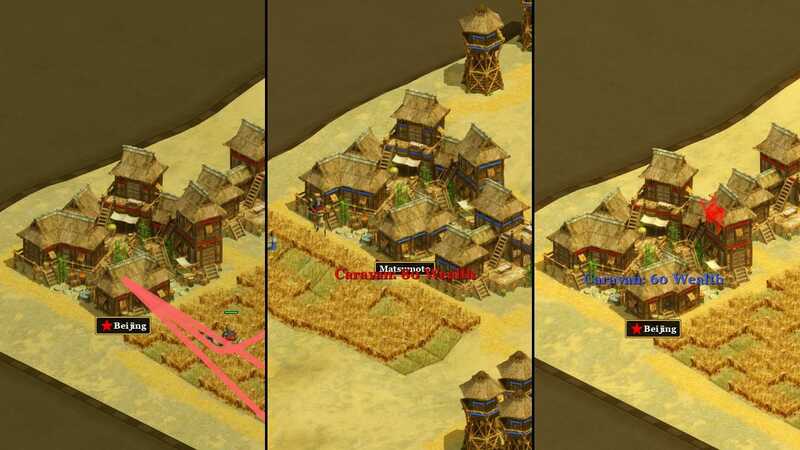 arriving at City B, and returning afterwards to City A), the Caravan will provide a once-off Wealth bonus. This bonus is equal to 10 + (Commerce tech level x 10). For example, having Commerce level 2 provides a Wealth bonus of 30 (twice), whereas a Commerce level of 4 provides a Wealth bonus of 50 (twice). A simple visual aid outlining the initial trade route formation and the corresponding Wealth bonuses. Once a route is set up, the position of the Caravan has no influence on its income. It could theoretically be forced into an extremely slow path around the entire map in order to move between two cities, but this would not affect the route’s income so long as the trade route is already set up. Obviously a long travel time would increase the time it takes to initially set up a new route. If a Caravan is no longer able to continue with its trade route (e.g. losing a city), it will once again automatically select the highest-income trade route available after a brief idle period. If no route is available, it will simply halt and await further instructions, probably while quietly crying. The base income for a trade route is 2 Wealth. 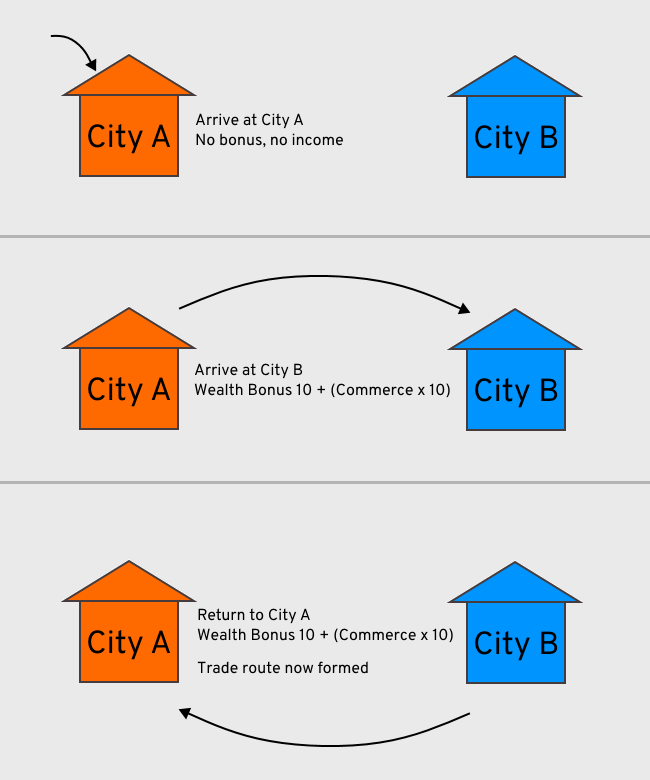 If you have two Small Cities directly next to each other with no additional structures at either of them, a trade route between them will generate an income of 2 Wealth. Each step up from a Small City adds 2 additional Wealth. Small City <-> Large City = 4 (2 + 2) Wealth. Small City <-> Major City = 6 (2 + (1×4)) Wealth. Large City <-> Large City = 6 (2 + (2×2)) Wealth. Large City <-> Major City = 8 (2 + (1×2) + (1×4)) Wealth. Major City <-> Major City = 10 (2 + (2×4)) Wealth. Each building within the economic radius of either city adds 1 additional Wealth. From my testing, this includes military buildings such as Stables, Towers, and Lookouts. Small City (+4 Farms) <-> Small City (+3 Farms) = 9 (2 + 4 + 3) Wealth. The distance between the two cities multiplies the rest of the equation by a range between 100% (no increase) and 200% (double). The multiplier depends on the distance, and it scales smoothly from 100% to 200% as the distance between the two cities increases. Two cities built as close as possible to each other (or nearly as close as possible) will receive a 100% multiplier i.e. no bonus. Two cities built very far from each other will receive a 200% multiplier, doubling the income of that trade route. Cities with an “in between” amount of distance will receive a multiplier between 100% and 200% depending on the distance. You cannot exceed the 200% multiplier by going from “very far” to “other side of the map”; you will still only receive a 200% multiplier on the route. 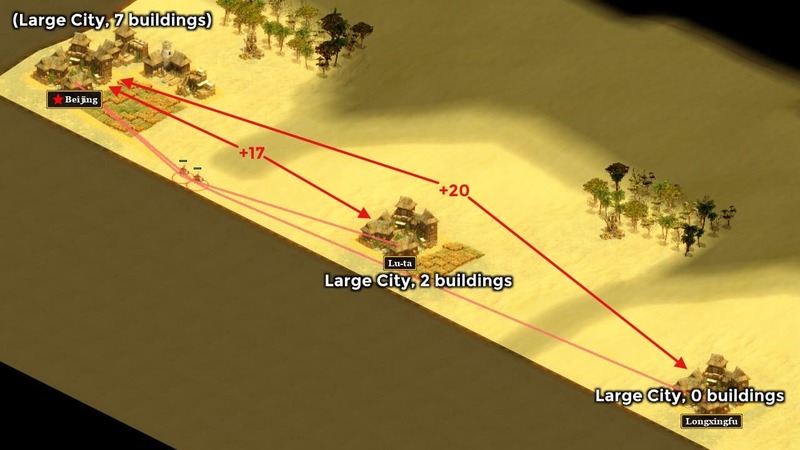 As best as I can tell, the distance calculation is based on a direct line between the two cities; if terrain is in the way this does not increase the multiplier even if the effective distance between the two cities increases. The Beijing <-> Lu-ta route has more buildings, but the extra distance of the Beijing <-> Longxingfu route makes it more profitable due to the distance multiplier applied. Once you reach Commerce 3, your Caravans are able to create trade routes with other nations so long as you’re not at war with them. This usually implies that the other nation is your ally, but you could also simply be in a state of peace, without an alliance. Trade routes work the same way whether the other nation is an ally or not. The caveat is that Caravans don’t automatically select trade routes involving other non-allied players, but will do so with allied players. If you want a trade route with a non-allied player used, you’ll need to explicitly instruct a Caravan to set one up. Trade routes with other nations are typically extremely lucrative for both parties. The calculation for the route’s passive income is the same as normal, except that the full income is given to both parties, without splitting it. In other words, each nation gains income from the trade route as if they owned both cities, which effectively doubles the total Wealth the route produces, since both nations get the full amount. Given that the cities of different nations are likely to be further apart than cities of the same nation, route income is usually higher when the trade route involves international travel. As for the once-off Wealth bonus for setting up a trade route, this bonus alternates between the two nations. When setting up a trade route with an ally, your Caravan will provide double the normal bonus to you upon reaching City B (typically the other player’s city). Once it completes the loop and returns to city A, the other player receives the second Wealth bonus, which is also double the normal amount. The once-off bonus in this situation is still based on the Commerce level of the player receiving the bonus, not the Commerce level of the player that owns the Caravan. As Red: Caravan arrives at Beijing (City A); Caravan arrives at Matsumoto (City B) and I receive a double-bonus of 80 Wealth (I have Commerce 3); Caravan returns to Beijing (City A) and Blue receives a double-bonus of 60 Wealth (they have Commerce 2). You will probably rarely if ever use the information in this article to change your Caravan routes, given that Caravans already figure out the highest income routes by themselves and there’s few reasons to deviate from them. It’s also rarely worth changing a Caravan’s existing route except due to danger, because swapping from a medium-income route to a high-income route introduces downtime where the Caravan is no longer generating Wealth while setting up its new route. Regardless of that, I trust this article is informative nonetheless, and that the notes I’ve made are helpful to have available. If nothing else, you can rest easy knowing that your Caravans have got it all figured out for you. One practical use for all of this info is to wait on a Caravan’s once-off bonus to get enough Wealth to build or research something important. Being able to know the incoming Wealth bonus ahead of time allows you to make more efficient use of said Wealth, particularly in the early game. For a default-dangerous Caravan route you could also eyeball your cities to estimate which actually-safe route would be most profitable when re-routing your Caravan. half_lotus gets most of it at least. At least one person online was under the impression that Caravans will automatically re-route themselves when a higher-income route is available – I’ve been unable to replicate this in any of my testing, and have also never noticed it happening in my own games. As such, I believe it to be incorrect. It’s possible that this person lost Caravans and/or Cities and then the new Caravans (or existing now route-less Caravans) simply [re]calculated the best available route as you’d expect them to.